We just wrapped up our first ever 3D design and printing class in the School of Communications at Webster University and I think we can call it a success. Our students designed and printed three different objects and left fired up about 3D printing technology. Identify different types of 3D printers and be able to explain how they work. Choose appropriate modeling software and processes for different types of 3D visualization tasks. Troubleshoot common 3D printing problems to improve print quality. 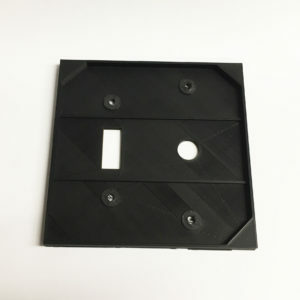 Use 3D prints to help support creative projects within the communications field. One of the challenges in designing and delivering this course was to make it relevant to Communications students enrolled in the course who came from a variety of majors. So we designed projects that we thought would appeal to different types of students: a branded phone accessory, a household good and a game character. Students also worked in a variety of software applications, including: Tinkercad, Adobe Illustrator, ShapeShifter and Meshmixer. 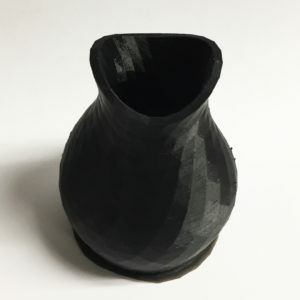 While 3D design and printing might not be immediately relevant to a communication students’ course of study or their first jobs out of college, it is an empowering experience for them. They are able to actually make something physical that solves a problem in their everyday lives. It encourages them to experiment, fail, revise and try again. Next → Next post: The typeface says more than the words.